Baum-Kuchen: Our German side of the family! 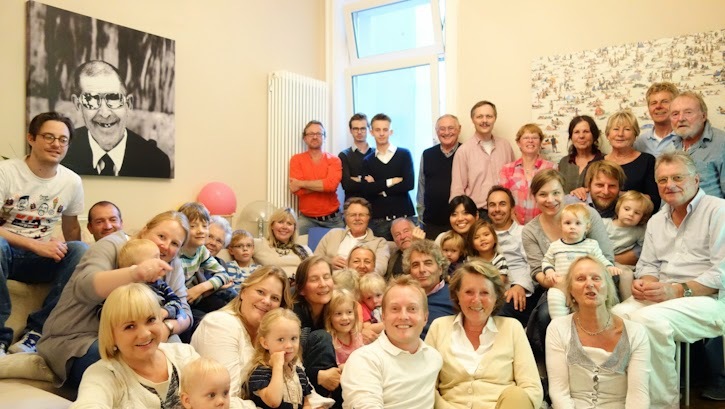 We had a lovely family reunion yesterday at Ana's home in Hamburg. Everyone from Heidi's side of the family was there... and I mean EVERYBODY! The afternoon (which turned into evening) was such a treat for us since we hear so much about the family from Heidi and Michael... but I have never met some of them. Well no more! I have officially met everyone from this side of the family. Ana's house in the middle of Hamburg was very special... with so many comfortable corners for little ones to play (she also has two kids similar to Satchi and Coco's age). Satchi jumped into meeting all her cousins and I rarely saw her for the entire night because she was playing here, there and everywhere... speaking in English and German! This trip is already making me feel that it will be worthwhile to speak more German (and Japanese) at our home in LA so that she can really communicate with her cousins. I enjoyed talking to some of Frido's cousins about parenting. Learning how parenting has no border. I was intrigued that one of Frido's cousin and his family chose to live in a very small village nearby Kiel in northern Germany by the sea where it's so safe and free for children to run around. That is definitely not our life in Los Angeles and I definitely have a longing for how free it can feel to live in the country side.